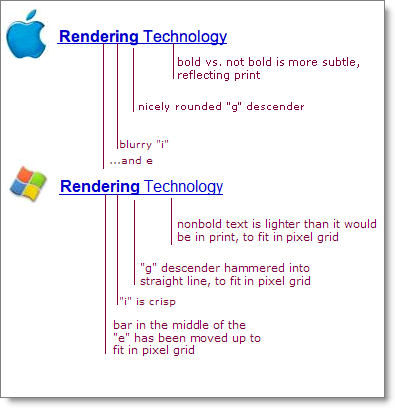 I want to recommend this post by Joel Spolski about differences in font rendering philosophy between Mac OS & Windows. It's been 3 years since PHP 5 has been released. Yet PHP 4 still rules on the vast majority of web hosting platforms. This is annoying for PHP open source developers who cannot leverage the potential of PHP 5 as long as they need to support PHP 4. This is also annoying for the PHP development group since they still need to support PHP 4 instead of focusing on PHP 6. In a way it is also annoying for the web hosts themselves, since they too need to deal with clients who want PHP4 compatibility and others who want PHP5 features. What strikes me is that the solution seems obvious, and yet the PHP team fails to recognize it. The only reason webhosting providers haven't massively upgraded to PHP 5 yet is because it would break applications running on their current client's site. It may also prevent new clients from installing well known applications (phpBB...) which may fail on PHP5. Of course, that would not have been such an issue if PHP5 was indeed upward compatible with PHP4. But it isn't! (object references, clone keyword, etc.) So what do we do now? Web hosts install PHP5 next to PHP4, but you need to rename your scripts to script.php5 instead of script.php ... which breaks existing URLs... so no-one uses that either. The real simple solution would be for the PHP team to release some PHP 5.x version which would actually behave like PHP 4 (completely!) with a simple config switch. It could then be installed in place of PHP 4 without breaking anything.